Dubai, UAE, December 05, 2018: The holidays are here, bringing with them endless hours of enchantment. It is a time to enjoy magical moments with your loved ones, a time for coming together in celebration in a festive atmosphere. 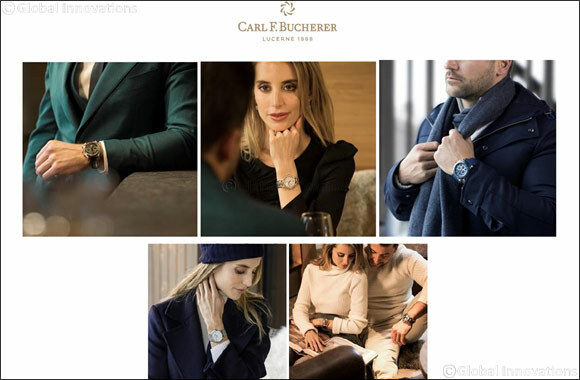 Watches from Carl F. Bucherer make the most wonderful time of the year even more precious. Timepieces designed with sophistication and technical savoir-faire add that special sparkle to any moment. The Manero Tourbillon DoublePeripheral is a stylish and exclusive men’s watch featuring the globally unique CFB T3000 manufacture movement. In a world first, the Lucerne-based watch manufacturer has combined a peripheral automatic winding system and a peripherally mounted tourbillon. This special mounting gives the tourbillon a floating appearance, turning each second into a magical moment. The movement is framed by a classic round 43 mm case made from 18-karat rose gold with a brown alliga- tor-leather strap. With the Manero Peripheral, Carl F. Bucherer has created a watch of understated elegance that emanates sheer magic on the wrists of men and women alike. The coloring of the lancet-shaped hands and rose gold indices corresponds perfectly with the 43 mm case, for magical moments of romance. The classic warm 18-karat rose gold case of the Manero Flyback and elaborate chronograph movement con- vey elegance whatever the occasion. The sophisticated flyback function captures each and every exception- al moment – allowing the wearer to experience the magic of each fleeting second right there on their wrist. The highest standards in technology and innovation combined with striking design – that is what dis- tinguishes the Patravi collection by Carl F. Bucherer, and the Patravi TravelTec model too. It is the ideal companion for jet-setters who want to keep track of time in three different destinations – even during the holidays. With its reflecting scratch-resistant and shockproof surface and DLC finish, the Patravi TravelTec consciously avoids any superficial glamour, instead impressing with its high functionality and technical extravagance. men and women alike. The black dial with gold-plated hands, indices, and Arabic numerals emphasizes the stylish character of the Adamavi models. With the Pathos Diva, Carl F. Bucherer has created a collection that captures the charisma of femininity in a unique way. The finest materials, such as white and rose gold and diamonds, were used for the Pathos Diva collection. Created using the finest craftsmanship and embellished with precious stones or shimmer- ing mother-of-pearl, the Pathos Diva will light up the face of whoever wears it.